Hand of Fate 2 is a direct sequel to Defiant Development’s 2015 roguelike and we got our *ehem* hands on the follow-up at PSX. While we encountered some very forgivable bugs in our demo, Hand of Fate 2 felt fresh and fun. In Hand of Fate 2 (HoF2), you play as a nameless character who plays cards with the Dealer — the antagonist from the first game who has returned for his revenge. The game itself is actually a meta-card game that takes place on the tabletop between you and the Dealer where you complete challenges by using your deck of cards to survive RPG-lite “dungeon crawls”. There are 22 challenges in Hand of Fate 2, and we got to play the Hierophant mission. In this challenge, the Thieves Guild leader hires you to find and eliminate the person who plans to assassinate him. Each challenge begins with you building your deck of cards, including equipment, weapons and companions, and here I found a lot of diversity. Appreciably, each weapon plays differently from each other in combat (big weapons move slowly, daggers are quicker, etc. ), and companions come with unique perks that affect Hand of Fate 2’s gameplay. For example, players will occasionally be prompted to participate in a precision minigame that requires you to stop a needle when it passes over a specific area. Do it right, and you may be rewarded with gold. Do it wrong, and you might lose valuable health. However, if you select newcomer Estrella as your companion, you get a second chance if you aren’t satisfied with your first attempt. Choosing Colborn, on the other hand, gives you an extra die to roll in the Hand of Fate 2’s dice minigame. For our demo, we chose to bring Estrella along for the ride. Estrella is a new addition to Hand of Fate 2’s companions roster. Cards lay face down in procedurally generated domino patterns on the table, and one card — the mission goal — is upturned. The face down cards change every time you play, and they range from combat encounters with Arkham-style combat to NPC encounters featuring semi-text adventure gameplay. One card I stepped on put me in an encounter with a ravenous plant guarding an unknown treasure, but to distract it and snag the treasure, I had to sacrifice a ring that gave me an extra advantage in combat. Decisions in the card game impact combat, for example, a failed pickpocket attempt will reduce my health in combat, or siding with a certain faction might result in having to face more enemies in a combat encounter. On combat, Defiant Development told us that the feature was a major target area where the team wanted to improve. The result includes tighter dodging and countering mechanics and two great new mechanics. If an enemy is downed, you can use the trigger to perform an execution, and additionally, weapons now have special abilities that can be used after a successful string of attacks. Sometimes I felt that enemies just waited around for “their turn”, and additionally, in any encounter many of them look alike. This combination can make combat feel visually dated, but this is a minor complaint, because the action segments do such a great job of breaking up what could have been monotonous text-based gameplay. In combat, the meter (top right) fills quickly with each successful strike against an enemy, and when full, players get to unleash a devastating attack. The Thieves Guild leader believes one of his own plans to assassinate him, and he’s narrowed down the potential attackers to three people. Your task is to complete missions with each person — bribing and schmoozing when you can — to discern which of the three is the assassin, but you can only go questing with two of them before time runs out. I was impressed by the RPG gameplay that ensued; figuring out each person’s motives was more difficult than just running through all dialogue options, and it’s possible to not get enough information to identify the right person as the assassin. I quested with a bearded man who seemed suspiciously honorable and a woman who seemed more loyal to coin than her leader, so I accused the woman — but I was wrong! Estrella and I were thrown into a combat encounter against the woman, and after dispatching her, the Thieves Guild leader was disappointed in our decision. In true RPG form, there are different endings to challenges in HoF2 based on different win/lose conditions, and each ending bears a different level of reward. For you competitive players, each challenge has its own in-game objective, such as increasing your max hit point cap or, in my case, obtaining a certain amount of gold, and I enjoyed struggling to balance completing this objective in addition to the main challenge. When doing reconnaissance during the Hierophant challenge, you can bribe each suspect for information, but this is at odds with earning as much coin as possible (my side objective). Not only do side objectives like this one give your decisions more weight, but they definitely add to the game’s replayability. 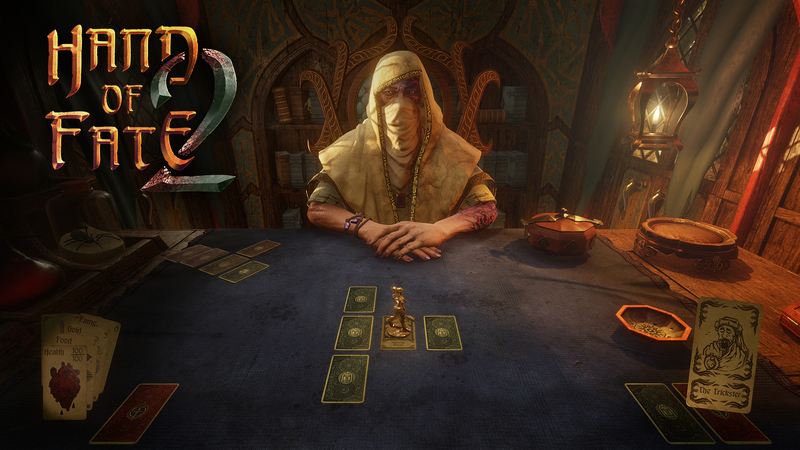 Hand of Fate 2 features diverse environments and a slew of different enemy types. In my demo, I encountered slippery, coin-stealing goblins, rock creatures and traditional armor-clad knights. If Hand of Fate 2 isn’t on your radar, it should be. Its melting pot gameplay caters to different types of players, from those who enjoy action/adventure games to those who enjoy traditional tabletop experiences, and so far, it’s succeeding at each of these. Hand of Fate 2 is expected to launch in Q1 2017 on PC, PS4 and Xbox One.